As you can see the M block is just opposite to the K block. The effect of K block being developed and having possession has affected prices of M block too and now the plot prices in M block have been revised. We have given average price ranges with available plot sizes of residential plots in all blocks of PECHS society. Please note that these prices are meant only to give you general idea of prices. Actual prices may be little above or below these price ranges depending of market situation. A block has 2 kanal residential plots. 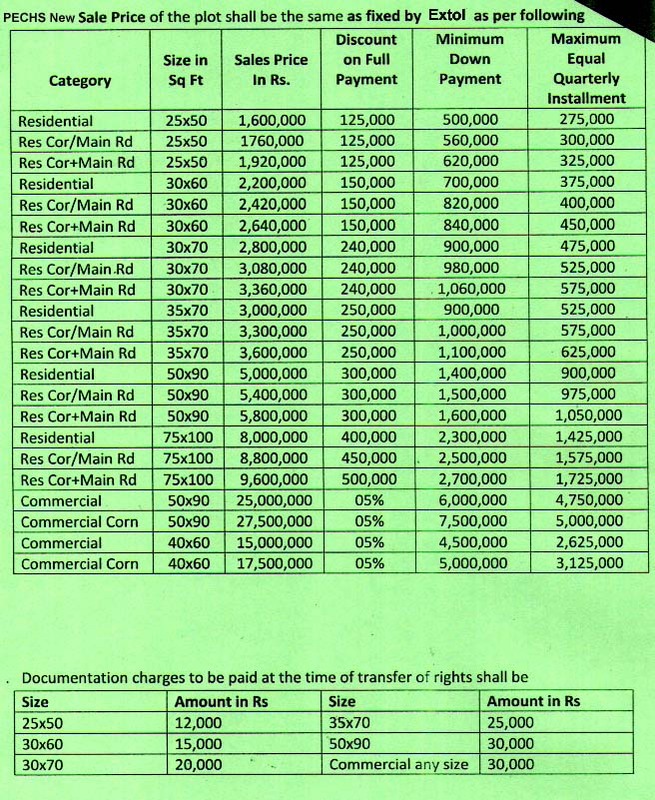 2 kanal plot price in A block ranges from 60 to 75 lac rupees. B block has 1 kanal residential plots. 1 kanal plot price in B block ranges from 35 to 45 lac rupees. C Block has 14 marla, 1 kanal and 2 kanal residential plots. 14 marla plot price in C block ranges from 25 to 30 lac rupees. 1 kanal plot price in C block ranges from 30 to 45 lac rupees. 2 kanal plot price in C block ranges from 60 to 80 lac rupees. C-Extension block has 300 yards residential plots. 10 marla plot price in C-Extension block ranges from 18 to 25 lac rupees. D block has 1 kanal and 2 kanal residential plots. 1 kanal plot price in D block ranges from 28 to 35 lac rupees. 2 kanal plot price in D block ranges from 60 to 80 lac rupees. E block has 2 kanal residential plots. 2 kanal plot price in E block ranges from 55 lac to 70 lac rupees. F block has 5 marla, 10 marla and 1 kanal residential plots. 5 marla plot price in F block ranges from 12 to 14 lac rupees. 10 marla plot price in F block ranges from 22 to 25 lac rupees. 1 kanal plot price in F block ranges from 28 to 40 lac rupees. G block has 1 kanal residential plots. 1 kanal plot price in G block ranges from 28 to 35 lac rupees. H block has 1 kanal and 2 kanal residential plots. 1 kanal plot price in H block ranges from 25 to 35 lac rupees. 2 kanal plot price in H block ranges from 45 to 60 lac rupees. K block has 9 marla, 1 kanal and 2 kanal residential plots. 9 marla plot price in K block ranges from 18 to 25 lac rupees. 1 kanal plot price in K block ranges from 32 to 40 lac rupees. 2 kanal plot price in K block ranges from 65 to 80 lac rupees. Note: These prices are just an assessment of prices. Actual prices in PECHS Society may fall within given range or may be totally different depending on current market situation, investment trend and demands of owners.